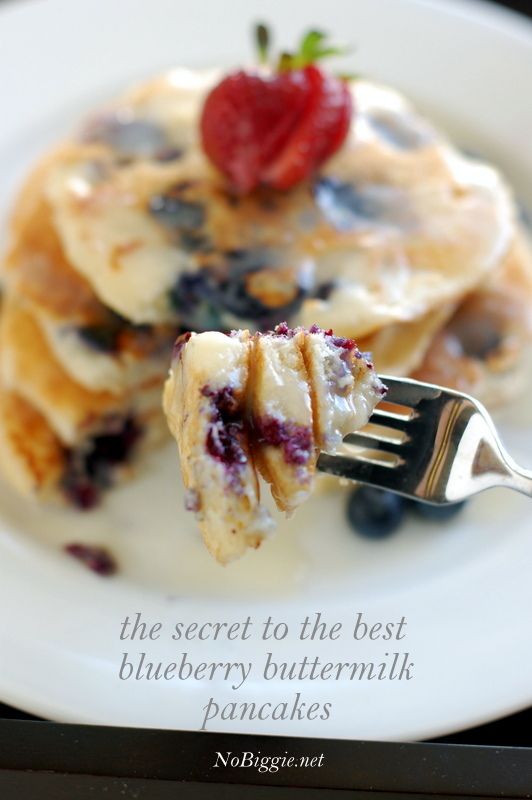 Tips and tricks to making the BEST Blueberry Buttermilk Pancakes. I’m on a breakfast kick around here lately, but when it comes to pancakes…I’ve been making them all wrong for so many years! 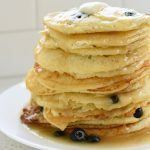 This new way of making pancakes is definitely something to do on a slower morning when you have a little more time, but once you try them, you’ll want to eat these pancakes for breakfast lunch and dinner! First up, buttermilk makes everything better, don’t you think? It’s that tangy zip! 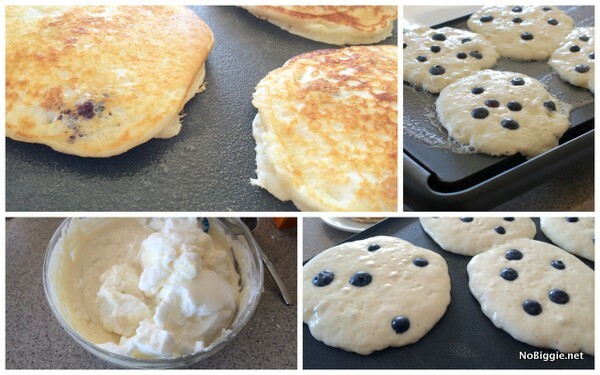 …but then you add big blueberries, and oh wow, these pancakes are so happy now! Here’s the big a-ha moment I had while making these, that I’ve never done before. Separate the egg whites from the egg yolks, and whip the egg whites into stiff peaks before you fold them back into the batter. This is the secret for the most light fluffy pancakes. Have you ever tried this before? You’ll have to try this next time you make pancakes, it really makes them so good. Plus, make sure you just hand place the blueberries into the pancakes as they cook, this makes it so the blueberries only cook on one side. 1-Preheat an electric griddle to 375°F. Whisk together the flour, baking powder, baking soda, salt, and sugar in a medium bowl. Add the beaten egg yolks to the buttermilk. Add the 4 tablespoons melted butter to the dry ingredients and whisk to combine. Add the wet ingredients to the dry and combine. The batter should have small to medium lumps. Finally fold in the whipped egg whites. 2-Test the griddle by sprinkling a few drops of water on it. If the water bounces, it’s ready. Butter the griddle to prepare for the batter. 3-Using a 1/2 cup, scoop and pour the batter onto the griddle about 2 inches apart. 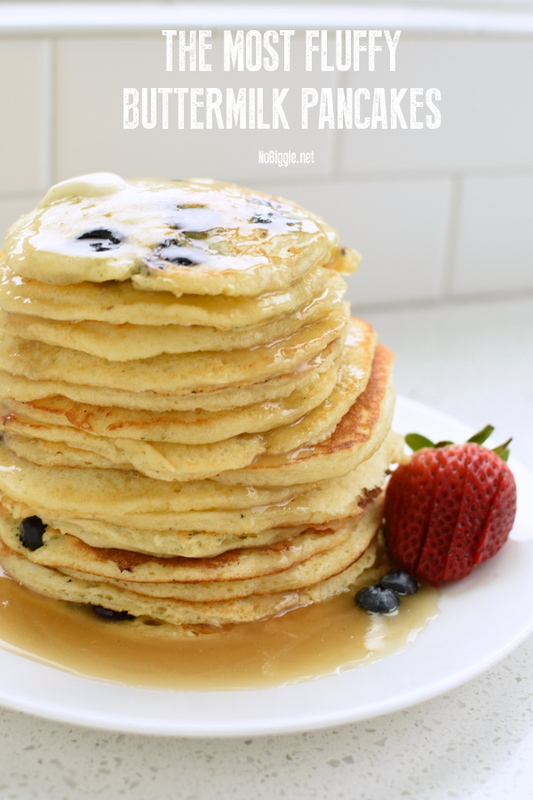 To make blueberry pancakes, hand place about 5 or more blueberries into each cooking pancake, pressing each one in slightly. When the pancakes have bubbles on top and are slightly dry around the edges, about 2 1/2 minutes, they’re ready to flip over. If any batter oozes or blueberries roll out, push them back under with your spatula. Cook until golden on bottom, about 1 minute. Repeat with the remaining batter. Serve warm. 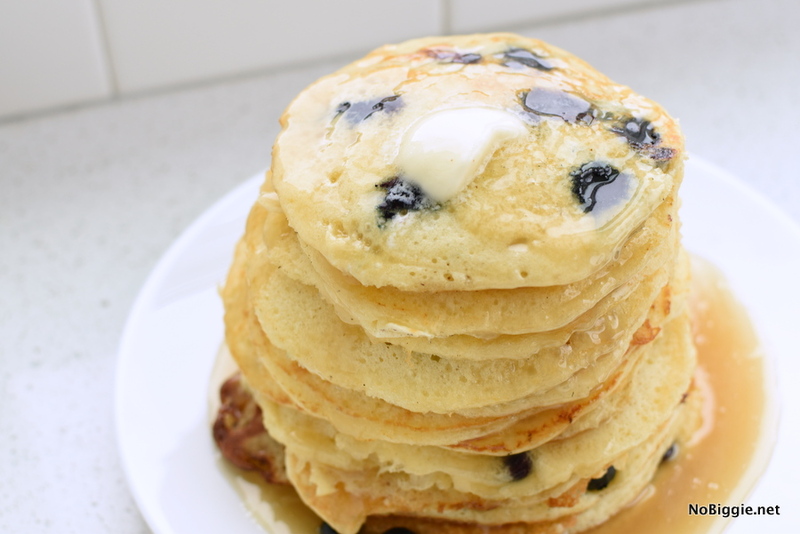 Make the most fluffy blueberry buttermilk pancakes. Preheat an electric griddle to 375°F. Whisk together the flour, baking powder, baking soda, salt, and sugar in a medium bowl. Add the beaten egg yolks to the buttermilk. Add the 4 tablespoons melted butter to the dry ingredients and whisk to combine. Add the wet ingredients to the dry and combine. The batter should have small to medium lumps. Finally fold in the whipped egg whites. Test the griddle by sprinkling a few drops of water on it. If the water bounces, it's ready. Butter the griddle to prepare for the batter. Using a 1/2 cup, scoop and pour the batter onto the griddle about 2 inches apart. To make blueberry pancakes, hand place about 5 or more blueberries into each cooking pancake, pressing each one in slightly. When the pancakes have bubbles on top and are slightly dry around the edges, about 2 1/2 minutes, they're ready to flip over. If any batter oozes or blueberries roll out, push them back under with your spatula. Cook until golden on bottom, about 1 minute. Quick Note: I was short one cup of buttermilk one time I was making these and I was happy to learn that you can make your own buttermilk with 1 cup of whole milk and lemon juice mixed together. To equal 1 cup, you need a 90×10 ratio of milk to lemon juice. Mix it together and you have buttermilk in a jiffy! 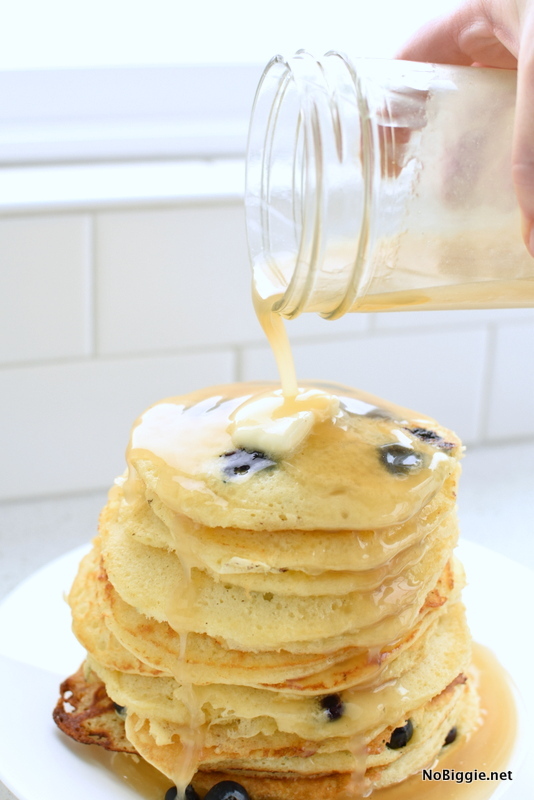 You’ll have to try these next time you make pancakes, they’re a game changer! Click here for the homemade buttermilk syrup recipe. We made a cute Mother’s Day printable for breakfast in bed that would go great with these delicious pancakes. Click here for the Mother’s Day breakfast in bed printable.